away from home at Lakeside. Lakeside is a place like the rest of the world ought to be! With a safe environment for all ages, you will enjoy visiting for a day, a week, or a season to which you will want to return! It’s for fun for all ages — all summer long. It’s where you meet and make friends for life! Lakeside was founded in 1873 and is designated as an Ohio Historic Site. It is a family-oriented resort community. Recreational facilities include swimming, fishing, miniature golf, volleyball, basketball, tennis, shuffleboard, sailing, and much more. A variety of programs are offered each day—something for every age—games, crafts, continuing education, health, and many other offerings. At 8:15 each night Hoover auditorium is the site of live entertainment—big bands, classical, jazz, pop, blues, and folk music, ballet, variety shows—as well as the Lakeside Symphony Orchestra (in residence). Visit the Lakeside website to view the entertainment schedule for this season. Quaint and picturesque Lakeside is the site of 850 cottages (many Victorian era), Hoover Auditorium (seating 3,000), parks, playgrounds, guest lodging, and a pavilion with a dock jutting out into Lake Erie. First-time guests are enchanted, amazed and leave Lakeside with the conviction that they have made a real “find”—knowing that they “will return” again and again. Lakeside is in the heart of the north coast Lake Erie vacation-land area. In the business district are gift shops and restaurants, as well as a beauty parlor and laundry. Bicycles and golf carts are available for rental. Within a short drive are destinations such as Cedar Point, museums, ferry boats to Kelley’s Island and Put-In-Bay, fishing charters, shopping and fine dining restaurants. Please note that all these wonderful activities in Lakeside do have a cost. The 2013 prices for a 24 hour pass (for just about everything Lakeside offers) is $19/person. 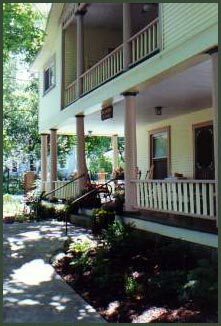 The Idlewyld B&B is your home away from home at Lakeside.